C. paupercula of Michigan Flora. In sphagnum bogs, coniferous swamps (tamarack, spruce, cedar), boggy hollows, and occasionally wet open ground; rock crevices along Lake Superior. 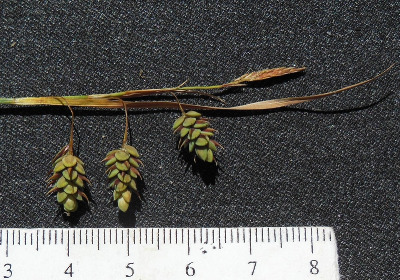 The terminal spike rarely has a few perigynia, but the plants can be distinguished from C. atratiformis by their longer pistillate scales and pubescent roots. The leaves of C. magellanica tend to be flatter, broader and less glaucous than those of C. limosa, which has very slender, often ± involute glaucous blades. MICHIGAN FLORA ONLINE. A. A. Reznicek, E. G. Voss, & B. S. Walters. February 2011. University of Michigan. Web. 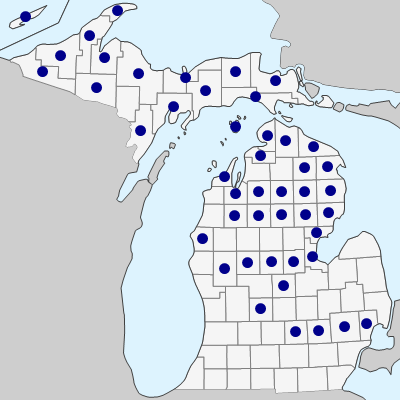 April 19, 2019. https://michiganflora.net/species.aspx?id=1004.